In this window are congregated diverse configurations linked to the exhibition format and the way of update. Keep Values - Allow to keep the values of the last access to the form, thus having this value in the next access. Horizontal Alignment - Allow to define the horizontal alignment of the application. The options are: center, left and right. Margins - Allow to define the application margins (Above, below, right and left). 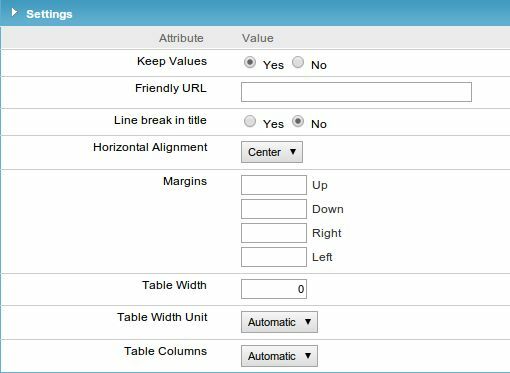 Table Width - Allow to define the table width of the application. Table width unit - When defining the property “Table width” can determinate the width unit, they are: Percentage, Pixels and Automatic.